← Five years, that’s all we’ve got; or so the NGOs would have you believe. It’s true that for every disaster that might befall us, there’s a group taking an almost pornographic delight in talking about it as if it’s inevitable. Current favourites are climate change, terrorism, a ‘flu pandemic, Peak Oil and global financial meltdown. What steps you take depends on who you are and where you live. In the USA, you buy a remote stronghold and stock up on beans, bullets and band-aids. In the UK, you queue outside your bank and treat yourself to a beige cardigan from M&S. Well, here’s a bunch of people who are really putting their money where their mouth is. The Lammas community is creating an ecovillage in Pembrokeshire which will become a demonstration model for low impact living. “We aim to combine the best of the old with the best of the new. Our project is based on the traditional welsh smallholding model. To this we will also bring the latest developments in environmental design, green technology and permaculture. We are currently applying for planning permission for stage 1 of the project. We are optimistic that we will succeed. “The proposal is for a new settlement of eco-smallholdings. It will be sited on 175 acres of mixed pasture and woodland next to the village of Glandwr. The Ecovillage will be completely independent of all mains services. All water will be sourced from the site using a combination of an existing spring for drinking water and rainwater harvesting from rooftops. All electricity will be produced on site using renewables. Fortunately there is an existing water turbine system on site which Lammas plans to renovate. All organic waste will be composted on site using a combination of compost toilets, wormeries and compost heaps. This group deserves all the praise and support they can get, as does the Pembrokeshire local authority, currently the only county in the UK with a low-impact policy (if you don’t count Milton Keynes!). Will their ideas and ideals enter the mainstream? I wish. This entry was posted in Climate change, Community Projects, Permaculture, Planning, Renewables, Rural communities, Sustainablity, Thinking outside the box. Bookmark the permalink. I’m off to tell the wife we’re moving to Pembrokeshire. Oh hang on a minute, it’s a bit far from London. I like me urban gritty politti me. Damn, if only one could have the best of both. Love the idea and hats off to the Pembrokeshire local authority, being the only county in the UK with a low-impact policy. The village looks utterly enchanted. Great and inspiring project. Pembrokeshire is a beautiful part of Britain. We’ve spent many happy holidays there. Fantastic coastlines. 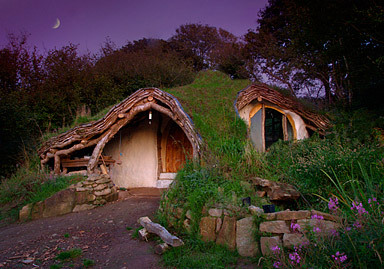 A lovely place to live a sustainable, low impact lifestyle. I’ve just joined the Lammas email list so I can be informed as to when they start their building work. Free camping and food if you join in the building work. Good way to learn these increasingly used techniques too.